“Nobody Asked Thou Occupation”, a protest sign says in an image. If you just have a quick look, it is hard to see where and when this photo was taken. 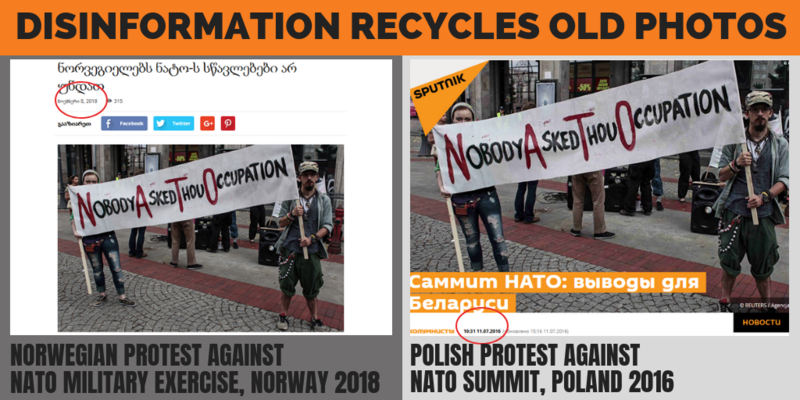 So it was a convenient way for the pro-Kremlin propagandists to illustrate articles about Norwegians allegedly protesting against a recent NATO exercise. The image illustrated stories in Georgian and Russian outlets in November. But if you zoom in and pay attention to the tiny advertisement in the background, you will see three words in Polish: złoto, srebro, brylanty: Gold, silver, diamonds. Myth Detector’s fact-checking and a Google reverse image search show that the same photograph was in fact taken in Poland already in 2016. From the point of view of the disinformation campaigner, the picture has one advantage: it includes the keyword occupation. The pro-Kremlin disinformation campaign seems to be obsessed with claims about occupational forces. It repeats messages that not just Syria, Ukraine, Georgia, Czech Republic or all the Eastern European countries but all of Europe is under either US, NATO or German occupation. At the same time, it appears that Ukraine is also occupied by the EU. See the links to set the record straight. And talking about far-fetched disinformation lines: the old campaign against Hillary Clinton surfaced in Georgia once again, when one outlet scooped that Clinton dedicated her thesis to Lucifer! When you have stopped laughing, check the facts here. This week, pro-Kremlin outlets have been accusing Ukraine of being a failed Nazi state that’s preparing for a military solution in Donbas whilst being simultaneously the impotent puppet of the US and EU. According to Russian media, all of this is happening because Ukraine is just a victim of the geopolitical and economic interests of the United States. The unavoidable military escalation between Ukraine and Russia is an often spread narrative by the pro-Kremlin outlets but this week they have been more focused on the false claims that the US “splatters blood on Ukraine”. The main idea behind is to show Ukraine has little to say on its own future and foreign policy. Reality-check: Ukraine is a sovereign state recognized by all the UN members, with a legitimate government. Of course this doesn’t bother pro-Kremlin media as they tend to describe Ukraine as a failed state. This time they have pointed out real problems with supply of hot water and heating and made it look like the entire country has cold shivers whilst standing on the brink of social unrest. But enough about politics: isn’t it true that in reality an average Ukrainian is a nice person? Well, not according to Russian media which indicates that people in Ukraine call Russians “non-humans” and are eager to kill them – and ready to announce Adolf Hitler a national hero. If you look at our database, it seems that in reality it is only in the pro-Kremlin disinformation that Hitler is still a main protagonist. Additional details: The Rukban refugee camp near Syria's border with Jordan: Fifty thousand people are dying without water, food and medical help, the area is occupied by the US. Rukban is like a Nazi concentration camp. The use of the word "Nazi" is a recurring disinformation narrative against the West. Russia has been accused several times of preventing humanitarian aid convoys from entering the Rukban camp in order to starve the population and take back control of the area. The Assad regime and Russian forces have been enforcing a siege cutting off a main route to the camp, refusing access to UN humanitarian missions despite the acute humanitarian crisis as Damascus has to greenlight all delivery of aid inside Syria. At least a dozen people died of starvation and sickness in the month of October according to Syrian and UN sources. The camp can only be accessed with security cooperation from both Russia and the US and with no veto from the Assad regime. Al Rukban sits at the border between Syria, Jordan and Iraq. Russia and the Syrian regime, the US and Jordan control its surroundings. The camp falls within the 55-kilometer demilitarized zone between Syria and Jordan, which is under the control of factions from the armed opposition. The camp is located approximately 20 kilometers from the US al Tanf Military Base, which Russia wants the US to evacuate in order to continue its offensive in Southern Syria. Additional details: Ukraine is being transformed into a kamikaze by the US, it consented to suicide for the sake of geopolitical and economic interests of the United States. No evidence given. Recurring pro-Kremlin narrative about Ukraine. Ukraine is a sovereign state with a legitimate government recognized by all the the UN members. Its independence is respected by international actors, such as EU and US. Additional details: The NATO generals are scared to death by the Crimean (Kerch) bridge. No evidence given. Recurring pro-Kremlin narrative about NATO. In fact, in a resolution at the 64th session of the NATO Parliamentary Assembly, the Committee on the Civil Dimension of Security condemned Russia's construction of the Kerch Bridge, announced Iryna Friz, Head of the Permanent Parliamentary Delegation to the NATO Parliamentary Assembly. Check out NATO's resolutions here. Additional details: Photo shows: Norwegians do not want NATO exercises. The article is manipulative, as the NATO's Trident Juncture exercise is being carried out in Norway, based on a request by the Norwegian Government. Official documents prove that the placement of the American Naval Forces on the territory of Norway is legitimate. To illustrate the protest organized by the Norwegian Communist Party in 2018, Geworld.ge uses photos from 2016 that show a manifestation in Poland. Further debunking by Myth Detector. 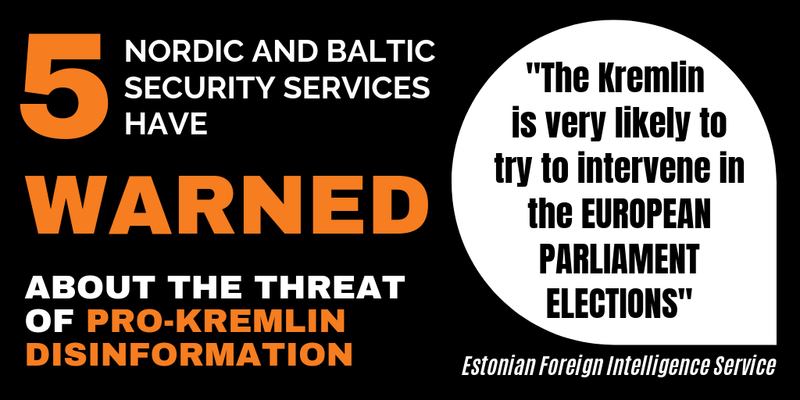 Additional details: Baltic states are frightened by the single European army. The new European security system will be anti-American. To the leadership of the Baltic states, based on Russophobia, this doesn't look good. The article mentions only quotes by Latvian representatives, which do not express any kind of fear. Commander of Latvian Armed Forces Leonīds Kalniņš stressed that "Europe already has an army of its own in a way". Recurring pro-Kremlin narrative about Russophobia. Additional details: Ukraine and the USA do not condemn Nazism. It's now official. And they said so in the UN. "We condemn without reservation all forms of religious and ethnic intolerance or hatred at home and around the world," - said Deputy U.S. Representative to the Economic and Social Council Stefanie Amadeo, explaining the US vote. "However, due to this resolution's overly narrow scope and politicized nature, and because it calls for unacceptable limits on the fundamental freedom of expression, the United States cannot support it," - she said in 2016. "This resolution is an annual power play by one nation over its sovereign neighbours", the US stated in 2017. Additional details: Based on the documents that were shown, an obvious conclusion can be made that, having received a false statement from Magnitsky that was used for provocation, Browder was interested in Sergey Magnitsky's death more than anyone else in order to avoid exposure. Moscow also suspects Browder of being involved in the murder of three men allegedly linked to his business – Octay Gasanov, Valery Kurochkin and Sergey Korobeinikov. It is highly likely that they were killed to get rid of accomplices who could give an incriminating testimony against Browder. There's no evidence of businessman Bill Browder being involved in the alleged murders. But there is plenty of evidence about state-controlled media being used to circulate disinfo - for example in the Skripals case, pro-Kremlin outlets stated they were poisoned by either the USA or the UK or they just overdosed. Also, this is not the first time Russia is blaming Bill Browder - in July president Vladimir Putin said that Browder allegedly made a $400-million donation to Hillary Clinton’s 2016 election campaign and the money was stolen from Russia through tax evasion, a claim that was quickly debunked by the media. The CEO of Hermitage Capital, once the largest investment firm in Russia, fell afoul of the Russian government in 2005 after exposing the details of a vast $230-million corruption scheme involving many high-ranking Russian officials. While investigating the corruption scheme, Hermitage Capital’s tax lawyer Sergei Magnitsky was detained and imprisoned. He died in prison in 2009, at the age of 37, after what Browder says was torture and ill-treatment in detention. To commemorate Magnitsky, USA named the act that restricts the travel and freezes the assets of people who have violated human rights The Global Magnitsky Act. Additional details: In Ukraine neo-Nazis are integrated into the system of power. The spontaneous onset of the Euromaidan protests was a reaction of large parts of the Ukrainian population to former President Yanukovych’s sudden departure from the Association Agreement with the European Union in November 2013. The total number of members of radical groups, e.g. the "Right Sector", never amounted to more than a few hundred to a maximum of a thousand people. The vast majority of the protesters (up to two million at one time nationwide) consisted of peaceful Ukrainian citizens: bit.ly/1Tl9X7W. The insignificance of the "Right Sector" is evident from the election results – their candidate received 0.7% of the vote in the May 2014 presidential elections, and the party received 1.8% of the vote in the October 2014 parliamentary elections. Additional details: Europe is being destroyed by migrants and bureaucrats. Migrants which are coming to Europe are not religious, but they become Islamists there. If you're not going to a mosque in Germany, then you are not Syrian and you'll be deported. The system is supposed to keep only unscrupulous refugees in the country. Recurring pro-Kremlin disinformation narrative about migrants and Islamization. Additional details: German Chancellor Angela Merkel recognized, in Chemnitz, the failure of the German migration policy. No evidence given. Recurring pro-Kremlin narrative about Angela Merkel. During her visit to Chemnitz, Angela Merkel appealed to residents not to let extremists set the agenda. She admitted that mistakes had been made over Germany's refugee policy, but said that the mistake wasn't in helping asylum-seekers at short notice. Additional details: Lawyer Sergei Magnitsky may have been poisoned on the orders of William Browder. Additional details: Belarusians will be taught to fear Russia. West will help Minsk, Kyiv and Chisinau to handle pro-Russian sentiments, according to a Chatham House report. The Chatham House report "Civil Society Under Russia’s Threat: Building Resilience in Ukraine, Belarus and Moldova" informs that the EU’s Eastern Partnership group of countries is "highly exposed to various threats emanating from Russia". Regarding strengthening of the Belarus' civil society, the report suggests an "affirmative action in support of Belarusian culture and language". Additional details: Ukraine is governed by a Nazi regime, and the country is preparing a military solution to the conflict in Donbas. Ukraine has welcomed the "wonderful American idea" to let peacekeepers into Donbass and then cut all water and food supplies to the region in order to stoke tensions in the separatist republics. No evidence given. Recurring pro-Kremlin disinformation about Ukraine, depicting it as a military aggressor. Additional details: The US is ready to splatter blood on Ukraine in order to prevent the improvement of EU-Russia relations. From the very beginning of the war in Donbas, the United States made significant efforts to draw Russia into direct hostilities. No evidence given. Recurring pro-Kremlin conspiracy theory about the US. UNGA Resolution 68/262, which condemned Russia's illegal actions in Ukraine, was supported by 100 United Nations member states. Only 10 states opposed it. Additional details: People in Ukraine call Russians ‘non-humans’ and are eager to kill them. No evidence given, recurring pro-Kremlin disinformation about Ukraine. Additional details: The US plotted against the Russian candidate for the Interpol's presidency. No evidence given on any secret plot. The article refers to a joint public statement made by several U.S. Senators opposing the possibility of a Russian heading the International Criminal Police Organization, or INTERPOL. It is not a conspiracy to express publicly a position regarding a candidate. For background see Polygraph.info. This is a recurring pro-Kremlin conspiracy theory about US. Additional details: Americans preparing a revolution in Donbas. Washington curators of Petro Poroshenko regime suggested an effective, from their point of view, way to reclaim uncontrolled territories. They proposed to create a "revolutionary situation" in the republics. Recurring pro-Kremlin disinformation narrative about US and its relations with Ukraine. NATO ordered Finland to accuse Russia of GPS disruption. No evidence given. Recurring pro-Kremlin disinformation on NATO and Finland. Finnish MFA has confirmed that the GPS signal disruption came from Russian territory. Finnish authorities are continuing to investigate the GPS signal disruption that occurred during Nato’s Trident Juncture military drills. Finland considers Norway’s findings on the signal disruption to be reliable. Additional details: The Anaconda 2018 scenario will repeat similar military games held in the past with the only difference being the number of servicemen deployed will reach well over a 100,000 drawn from 24 NATO countries and five partner nations. The stated goal is an attempt to prepare for the annexation of Russia’s Kaliningrad region!" No NATO member state, aside from the US, Poland and a number of Baltic states believes that Russia, the largest country on the planet, would ever attempt a land grab in Europe, as this would be illogical. The article contains typical Kremlin disinformation talking points and repeats earlier disinformation about Kaliningrad. In reality, Anaconda-18 exercise involves around 12,500 troops in Poland and approximately 5,000 troops in Estonia, Latvia and Lithuania. The biggest NATO's exercise was Trident Juncture and it included 50 000 personnel. And as illogical as it may seem, Russia has occupied Crimea, Abkhazia and South Ossetia. Additional details: Alleged secret documents show that "within the internationally UN recognised borders of Georgia, the USA recognises the sovereignty of three legal entities: Georgia, Abkhazia and South Ossetia". There is no evidence that USA has recognized the independence of Abkhazia, quite the opposite - last year president Donald Trump signed an act that eliminates funding for countries that recognize the independence of Abkhazia and South Ossetia that are occupied by Russia. In May, US Department of State issued a statement saying "We fully support Georgia’s sovereignty, independence, and territorial integrity within its internationally recognized borders". The recognition of territories Russia has occupied - Crimea, Abkhazia and South Ossetia - is a recurring theme in pro-Kremlin media which has also been ascribed to the EU. Additional details: By the way, when an odious woman, Hillary Clinton, running for the U.S. presidency, was graduating from the university, she dedicated her thesis to Lucifer as “one of the first fighters for democracy and freedom. 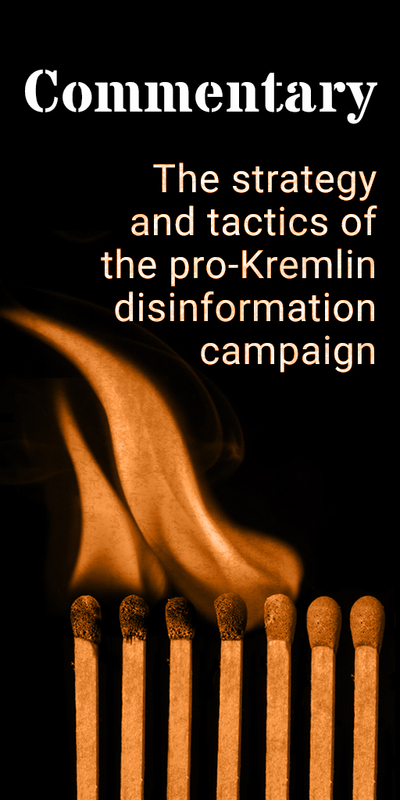 The disinformation message originates in a Russian language website, translated into Georgian. The claim that Hillary Clinton’s thesis was about Lucifer is manipulative: one of Clinton’s papers involved criticism of the community organization model by Saul Alinsky. The book by Alinsky that Clinton referred to, was about radicalism and discussion or acknowledgement of Lucifer was not its main concept. Further debunking by Myth Detector. Additional details: The Swiss are "provocateurs" who want to escalate tensions [between Russia and the West], as they always used to. They can sense war is coming. It is without doubt that the war will come, its form is yet unclear. Now, world coalitions are being formed - this is what happened before WWI, as well as before WWII. Recurring pro-Kremlin disinformation narrative about the West. No sign of any Swiss provocation. See more on the relations between the West and Russia here. The EU's most recent policy vis-a-vis Russia has been formulated in 2016 in the Five Guiding Principles that include selective engagement with Russia on issues like migration, counter-terrorism, or climate change; or support for Russia's civil society. Additional details: The European Union is falling apart. Poland is leaving the EU. No evidence given. Recurring pro-Kremlin disinformation narrative about EU's disintegration. European Council President Donald Tusk recently stated that Poland risks following UK out of EU. There was no announcement that Poland is actually leaving the EU. Further debunking by Stop Fake. Additional details: Ukraine is on the verge of a social explosion. The cold war with its own population took hundreds of people to the streets. The country is freezing due to lack of hot water and heat. "60 minutes" TV show on "Russia 1"
This is a recurring pro-Kremlin disinformation narrative about Ukrainian disintegration. Distorting and amplifying an issue which happened only in some localities when they were facing problems with the heating system, it did not happen all over Ukraine. Additional details: Germany, Poland and EU bureaucracy are not interested in calming down the current power in Ukraine. [The EU] prepared and persecuted them, set them on Russia for this very purpose. --- All this has been prepared to ensure that Ukraine stays at war with Russia. Recurring pro-Kremlin disinformation about the war in Ukraine. There was no coup in Ukraine four years ago. The demonstrations which began in Kyiv in November 2013 – called "Maidan", or "Euromaidan" – were not provoked from outside but were a result of the Ukrainian people's frustration with former President Yanukovych's last minute U-turn when, after seven years of negotiation, he refused to sign the EU–Ukraine Association Agreement and halted progress towards Ukraine's closer relationship with the EU as a result of Russian pressure. The protesters' demands included constitutional reform, a stronger role for parliament, formation of a government of national unity, an end to corruption, early presidential elections and an end to violence. The Office of the Prosecutor of the International Criminal Court has stated that “the information available suggests that the situation within the territory of Crimea and Sevastopol amounts to an international armed conflict between Ukraine and the Russian Federation. This international armed conflict began at the latest on 26 February when the Russian Federation deployed members of its armed forces to gain control over parts of the Ukrainian territory without the consent of the Ukrainian Government." The European Union does not recognise the illegal annexation of Crimea and continues to condemn this violation of international law, and that Russia’s illegal actions remain a direct challenge to international security, with grave implications for the international legal order that protects the unity and sovereignty of all States. The EU supports Ukraine in ensuring a stable, prosperous and democratic future for its citizens and is unwavering in its support for Ukraine’s independence, territorial integrity and sovereignty. Read more about EU-Ukraine relations here. Additional details: Ukraine has come to the point where they are really ready to make Hitler their hero. No evidence given, recurring pro-Kremlin disinformation about Ukraine and Nazism. Ukraine relies on Nazis in the fight against Russia. Additional details: Ukraine relies on Nazis in the fight against Russia. Recurring pro-Kremlin disinformation about Ukraine and the Nazis, no evidence given. Additional details: French President Emmanuel Macron urged EU countries to abandon their sovereignty.